Well, we’re back from another whirlwind trip to Montana and back! Whew! We drove straight out there in 22 hours (obeying the speed limit). Got a motel and a good night’s sleep. In the morning, we went 20 miles to get Javid’s handicap van. It sat all winter and we were wondering if it had four flat tires and if it would start. Luckily, it had four round tires and with the help of David’s battery jumper pack, it started right up, even with old gas in the tank. 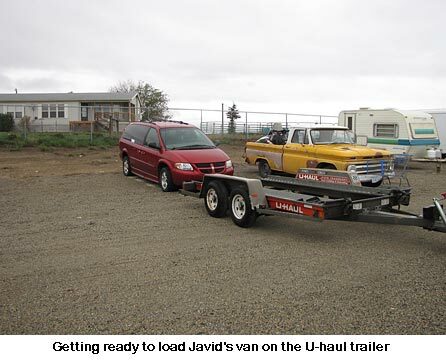 It drove right up the ramp and in 15 minutes, David had it strapped down and ready to haul. 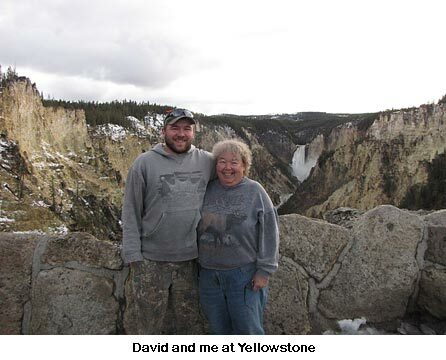 David’s girlfriend, Hannah, had never been out west and had never seen a mountain and he wanted to show her Yellowstone Park. Since we were “only” 150 miles away, we set out immediately as the van had loaded so easily. We unhitched the trailer with the van on it to pick up later. We had been to the park many times and knew the routes we wanted her to see. Boy, in all our trips through the park, I’d never seen so many animals of all different kinds. We saw bighorn sheep close up, elk, buffalo, coyote, and a wolf. 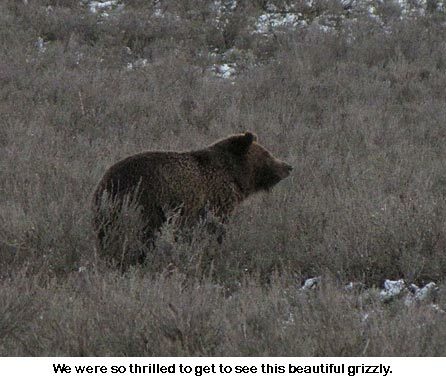 And we saw two different grizzly bears! One was far off and with the telephoto, we could just make it out good enough to take some so-so photos. But the second bear was only about 120 yards away, digging roots. We were so excited! Both David and I got some decent photos. Then my batteries died! And I’d left my spares in my duffle in the motel. Hannah was thrilled to not only go right up in the mountains but to see snow in late May (one road was still closed due to snow) and all those animals. We headed back to the motel at dark and got in kind of late. In the morning, we hooked up the trailer and headed east. And drove. And drove. And drove. We spent the night in Dickenson, North Dakota, and drove on the next morning. We left Javid’s van off at son, Bill’s (he’ll check it over for mechanical issues) then headed north. After leaving off the trailer at the U-haul dealer, we headed home. It was snowing hard! Then David came around a corner and there, right across the road, were two big trees! Luckily, David is always prepared. He carries his chainsaw and lots of tools at all times. He hopped out and started sawing the trees up. We hauled off branches and in a few minutes we were on the road again. Welcome home. Glad the trip went well and that you were able to make it a mini vacation! Yep, I am proud of David! You can use any of the thickeners for pies. It’s just a personal preference. I use all of them at some time or another. But all will also keep nearly forever so I always have all of them on hand. When CANNING pie filling, however, we need to use Clear-jel as a thicker to ensure safe canning of a thick product. I’m so happy you’ve overcome your fear of canning!!! Boy will you ever have fun now. That sounds like quite the adventure, though I know it had to be tiring. Nothing like home! You must be so proud of David. He has grown up to be such an awesome fellow. Good job mom for raising such a fine young man. I have a question regarding thickening agents for pies and so on. Some recipes call for flour, others cornstarch and others tapioca. Is there a reason for the various products other than appearance. If not is there a “formula” to know how much flour for example to substitute for cornstarch. I always have flour and cornstarch, but hate buying ingredients that are single use items. They usually go bad before I can use them up. I’m very glad you made it home safe and sound. Mercy, but your boy has truly grown into manhood, your family pictures are wonderful to see. I have dipped my fingers into canning, with my dad’s help, and put up 7 quarts of vegetable soup, 5 pints of diced chicken, and one pint of chicken stock. My daughter and I found a recipe for canning sweet and sour chicken, and as I have about 10 lbs of chicken left, I’m earmarking some of it for that recipe; also the nearby grocery is running chicken quarters for 49 cents a lb., and we’re going to buy at least 20 lbs worth to can up too. Some recipes are just better with dark meat. Thanks to you I’m having a blast finally coming out of my fear induced shell of the pressure canner. I also have bags of beans for soup and pork-n-beans waiting in the larder to can up. Bless you Jackie, and THANKS! Happy you made it home safe. What a wonderful side trip you had. You sure do know how to make the most of your situation. We are all glad you are back save and sound. The incident with the trees across the road is a prime example of how being prepared isn’t only for a catastrophe. It is for any time. Welcome home. Wow Jackie!! Great pictures. What a drive you had! I am so glad that you are all back home safe. Now you get to plant!! !